It is hard to stay away from this exhibit! Last Wednesday was a humid rainy day in NYC and Eunice, my friend from Sydney, was back in NYC. 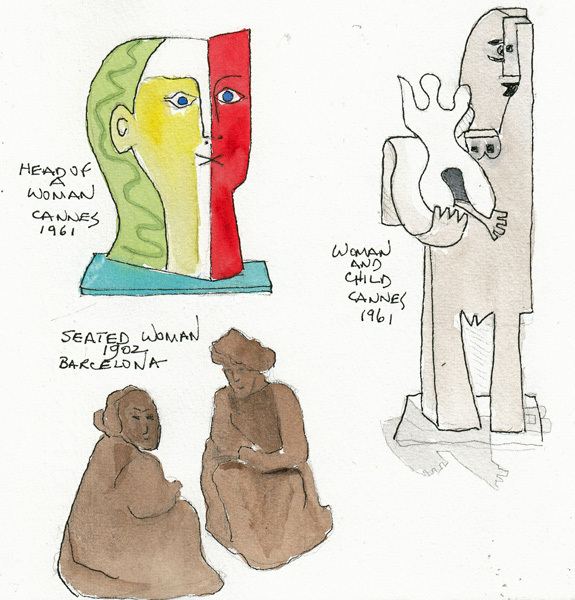 MoMA was incredibly crowded, but it was still possible to sketch more of my favorites. The two views of the small brown clay figure of a women sitting is his first sculpture, created in Barcelona in 1902. 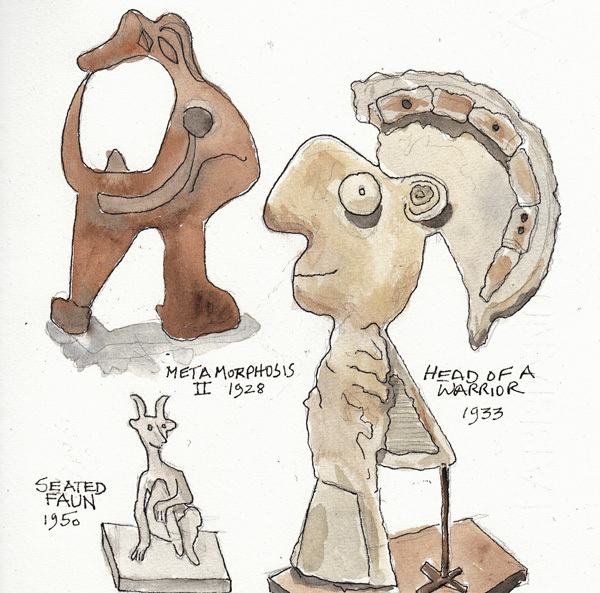 The other 2 sculptures on this page are from his last years - and are from the "sheet metal collection." There are 6 Absinthe glasses in the series and this is another one I like, drawn from the reverse side of the one I painted during my 2nd visit. This exhibit just opened at the Met and the sculptures are very powerful. 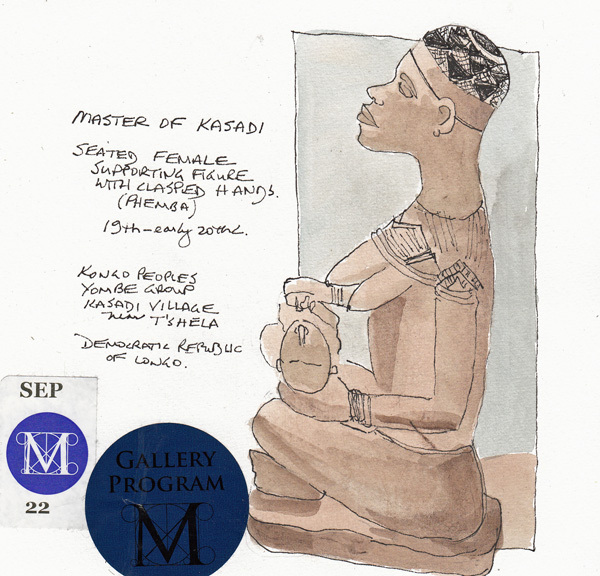 I was attracted to the Mothers and Child and the one I chose to sketch was one of 4 created by the Master of Kasadi. 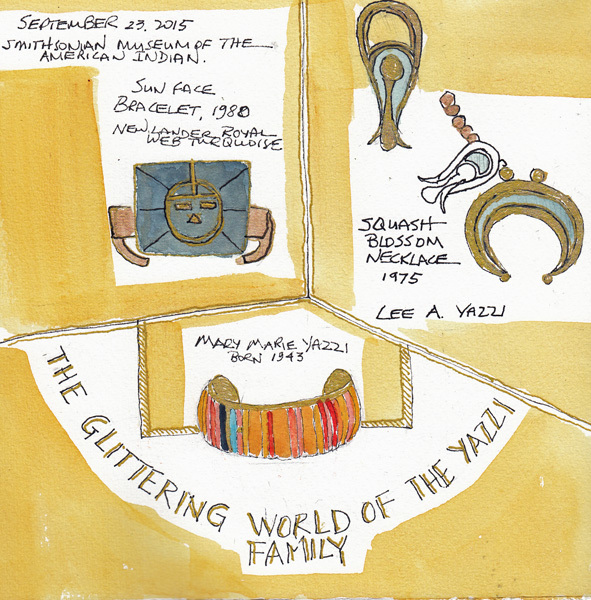 The Glittering World of the Yazzi Family: The Smithsonian National Museum of the American Indian in New York has a fantastic special exhibit of Navajo Jewelry created by the Yazzi Family. I don't especially like silver and turquoise Indian jewelry, but Turquoise and Gold or Coral is gorgeous. 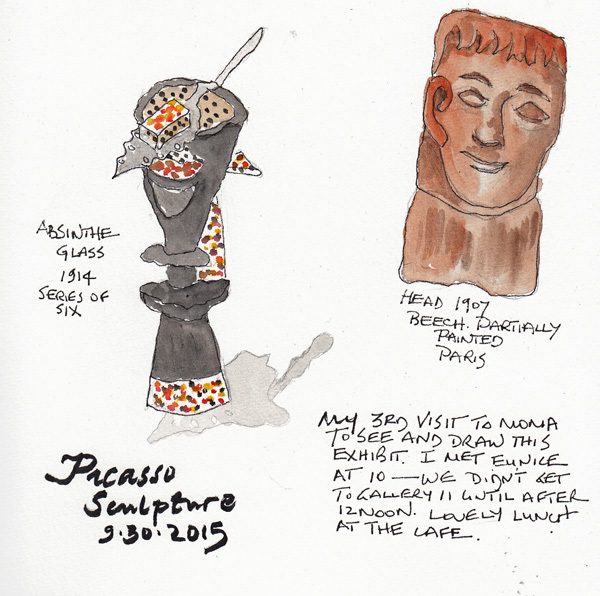 I LOVE the Picasso Sculpture exhibit at the Museum of Modern Art and went with an out-of-town friend last week. 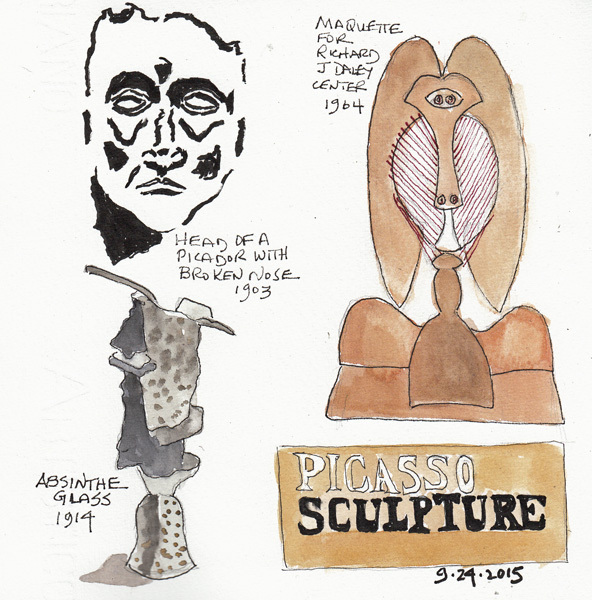 As I wandered through the 11 galleries, I chose random sculptures to draw - ones that really spoke to me. He used many different mediums and before the exhibit ends in January I will probably draw/paint many more. I sketched them in the museum and took a picture so I could paint them later. They are not drawn to scale. The Head of a Warrior is the largest of this group. When I was in the gardens in Wagner Park last week, I tried to paint loosely and without a preliminary simple pencil drawing. 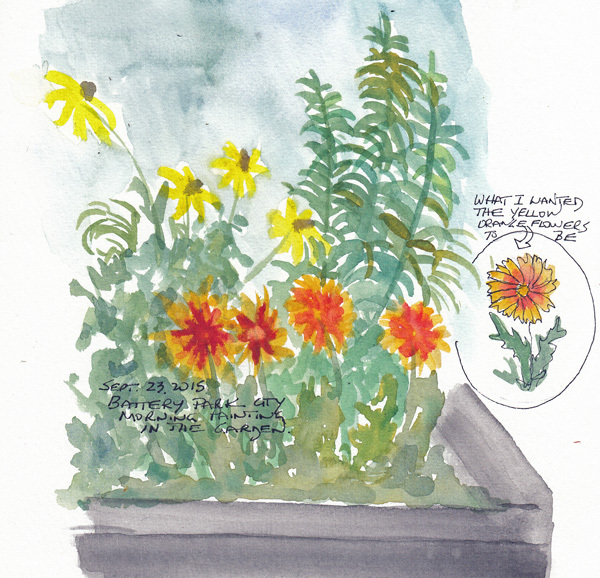 I found it very difficult to paint the yellow flowers, and at the end I sketched one with my pen and then added watercolor just to remember the actual shape and color. I definitely need to work on these using only a brush and paint. My homework after my FIT class was to paint an organic still life using 3 colors: Payne's Gray, a yellow (New Gamboge), and a red (Scarlet Lake). 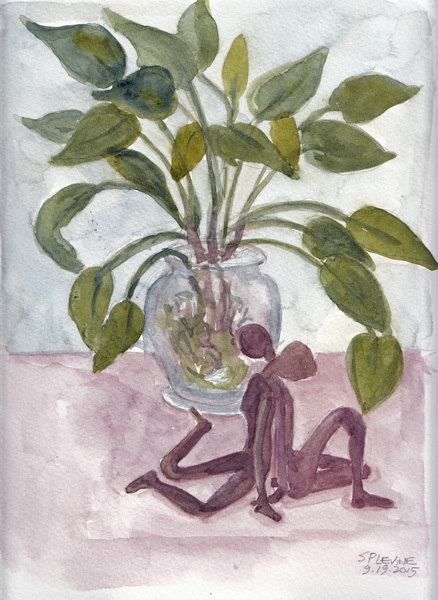 I lightly blocked out the plant and sculpture and then tried to paint it loosely and with different mixtures to vary the greens. 1. I am so used to working small that my preliminary drawings were too small regardless of where I started drawing. 2. 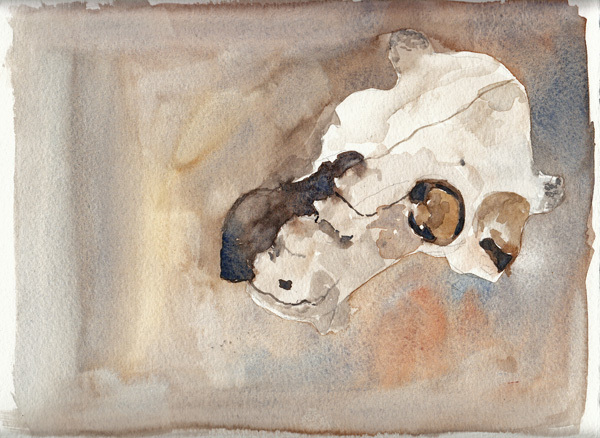 I found it very difficult to simplify the skulls. They are so complicated structurally, and I wanted to capture the different depths, angles, and holes. Without those structural details they were just big blobs. 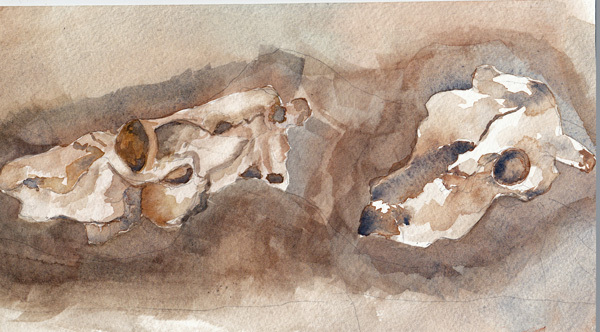 I'm hoping that I can work toward bigger drawings, and much looser painting. This week our homework is to draw "a flower" and we examined many paintings of Georgia O'Keefe for inspiration. I have a few beautiful, fresh sunflowers that I bought today, just waiting for me to paint one! 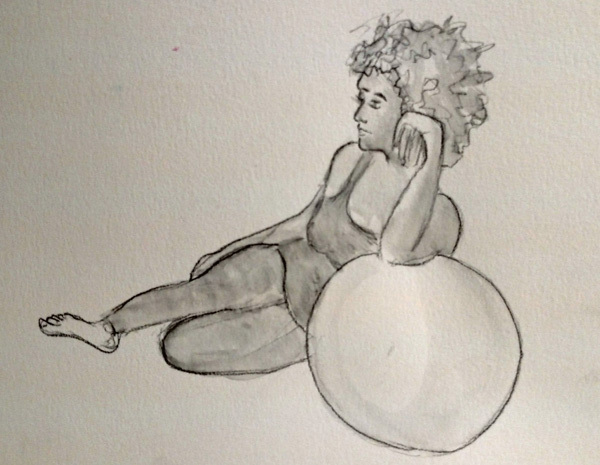 September 16th, we had a model with the largest head of curly gray hair, and I've enjoyed drawing her at various figure drawing venues previously. This time she used a big pink ball in some of her poses. 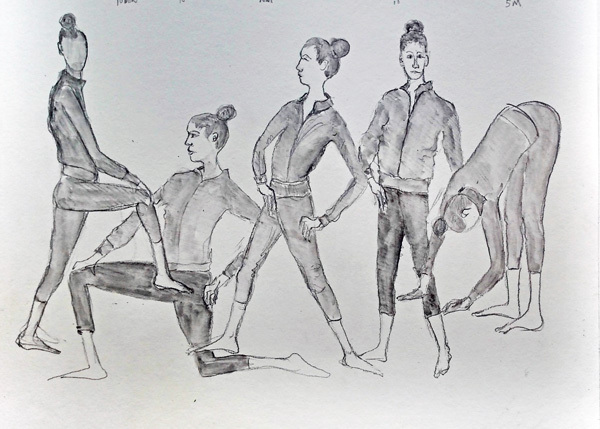 These are 3 of the 10 one minute poses that were fun. 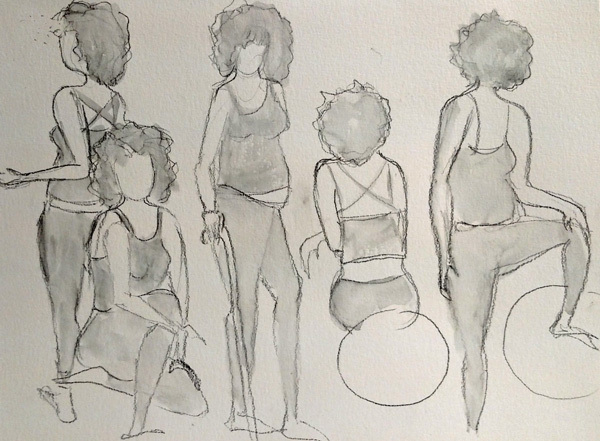 I put all of her 5 minute poses on one sheet of watercolor paper and used a Sketch and Wash pencil and my water brush to add gray tones. I only had time for one 10 minute pose before I needed to leave. 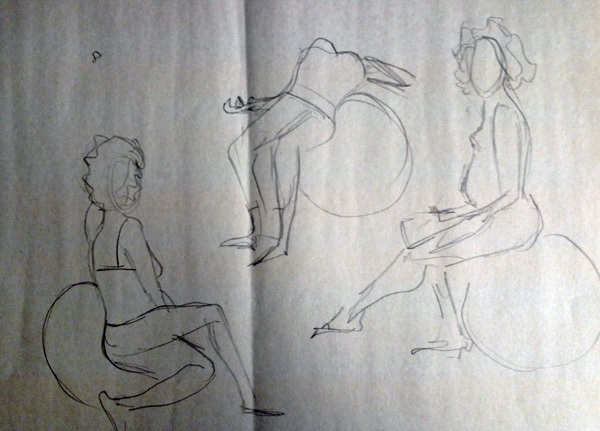 On September 23rd, I sketched the model on the right, middle, and left - and then squeezed in two more 10 minute sketches among the first 3. The drawings were again done with a soluble graphite pencil and then shaded with a waterbrush. Working out this composition was fun!